E-filing 2290 Tax Returns is no more a Tax Preparer Job. You can do it Yourself! Truck Dues believes in one time registration, enriched features and exclusive offers for the season. Whether you are filing prorated taxes or season tax for your big rig, we are here to assist and uphold the spirit of efiling with ease. Electronic filing is the fastest way to receive your IRS Watermarked Schedule-1 receipt at just $7.99 onwards, right from your door step. Connect to TruckDues.com and complete 2290 tax return anytime receive it in just minutes. Beats everything as we ensure success. 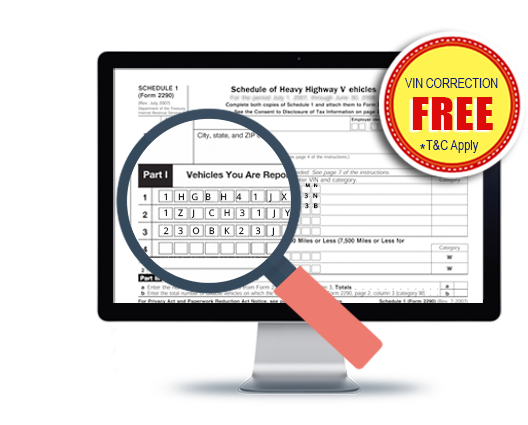 VIN Correction FREE* E-filing HVUT From 2290 is Expensive? Get Schedule 1 in minutes with new corrected VIN# for your use. Form 2290 - eFile Federal Heavy Vehicle Use Tax (HHVUT) Today! The Federal Heavy Highway Vehicle Use Tax - Form 2290 is now due for 2018-19 tax period for all heavy highway motor vehicles irrespective of their previous fling date. 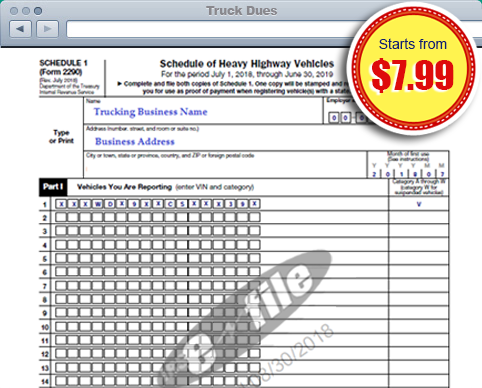 Efile it today at Truckdues.com and receive your IRS watermarked Schedule-1 receipt once IRS accepts your 2290 return. The highway use tax applies to highway motor vehicles with a taxable gross weight of 55,000 pounds or more. This is reported using IRS Tax Form 2290 for the tax year that begins July 1, 2018, and ends June 30, 2019. The actual deadline for most of the big rigs is August 31, for vehicles used on the road during July. For vehicles first used after July, the deadline is the last day of the month following the month of first use. Generally, if you e-file Form 2290, you can receive your IRS-stamped Schedule 1 receipt electronically to your email inbox minutes after e-filing. You can print your Schedule 1 and provide it to your state Department of Motor Vehicles without visiting an IRS office. If you choose to visit your local office, be aware that many Taxpayer Assistance Centers or Local IRS office now operate by scheduled appointments. e-File is 100% Accurate, when you miss out anything, we can get that intimated and help you in accurate filing. Electronic filing with TruckDues.com is designed to take the pain out of tedious paper work and gives you the convenience of reporting 2290 taxes online at your comfort. You can e-file now and pay the taxes using EFTPS, Credit/Debit card or directly allow IRS to debit your bank account using Electronic Funds Withdrawal (EFW) option. e-File could add more comfort to plan for your tax payments. E-filing saves you a lot of time, now it is inexpensive too. When you can get your 2290s e-filed at just $7.99, why paying more? So EASY! 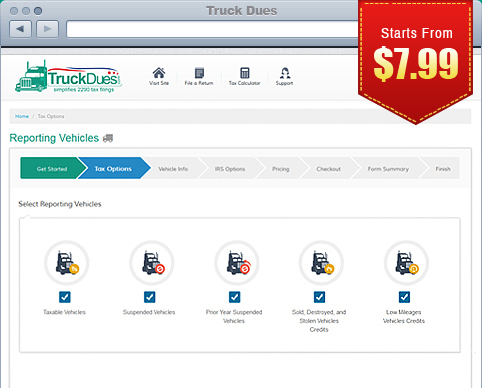 Truck Dues makes filing your reports so easy. I LOVE IT! Very easy to do, step by step. It's our 4th year with Truck Dues! I been used this website for 2 years and I loved it and excellent. Always helpful and a good company to work with. Satisfied and would recommend to all. Saves so much time, much easy to do it online here. Start a tax return anytime, log in back and continue from where you left. You need not require to start all over again, finish anytime. Truck Dues is an IRS certified efiling service provider specialized in web based tax preparation software. We have indulged in providing our customers with the highest degree of accuracy and completeness, zeroing down the possibilities of human error occurred in tax return preparation. This simple tax web product allows the user to make the efficient move to figure and report taxes to the IRS. 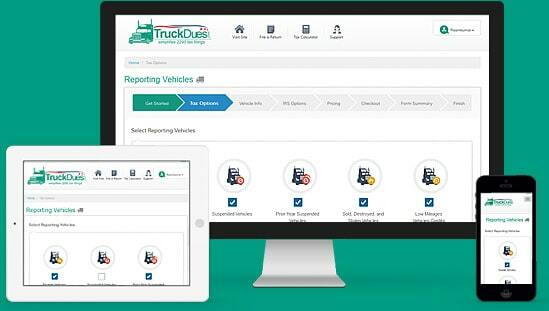 Read more..
Truck Dues with a fine integration of responsive framework, catchy features and attractive functionalities, we are easily accessible on your desktop, laptops, tablets and Smartphones, crafting our own mastermind plans. You can try for free we will not ask for your credit card upfront, just pay when you file or print your prepared tax form. We know the industry and we know to whom we serve so we offer this electronic filing service as low as $7.99 for single vehicle. Save your extra dollars. If we make an error, we fix it. We are open all year to assist you! TruckDues.com is an IRS authorized e-file provider. Truck Tax reporting made simple and secured.